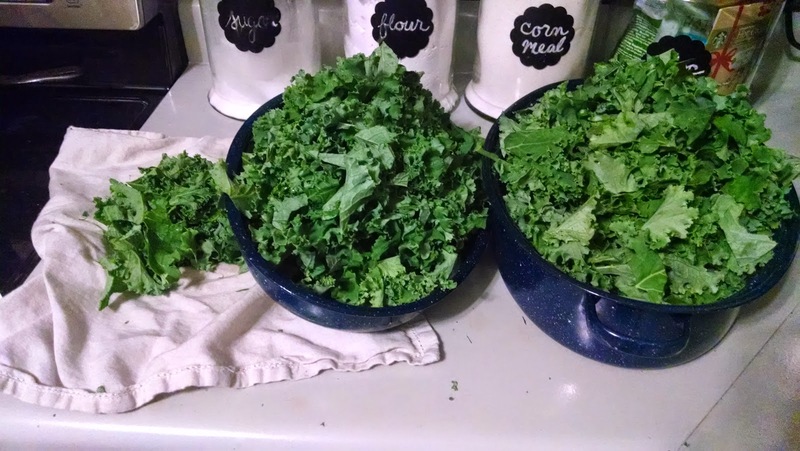 My Sunday night was not a typical one as I was up until 1am in washing, cutting, and blanching kale for the freezer. If I could have one super power, it would be to control time. 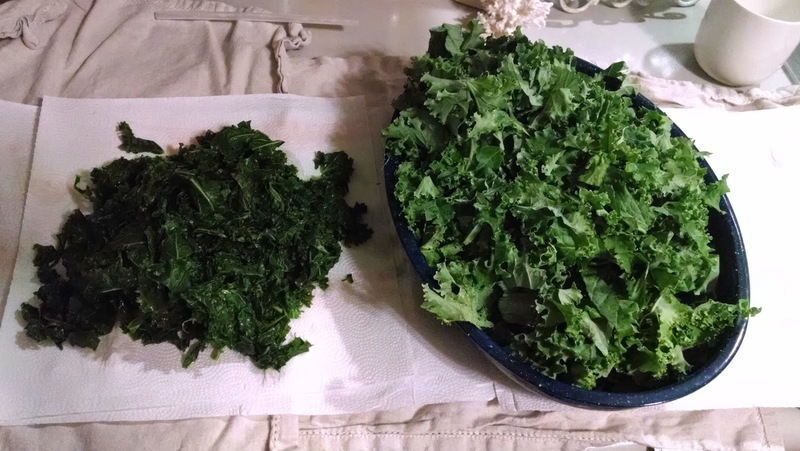 Step 5: Steam kale for 3 min. Step 6: Place in ice water for 3 min. 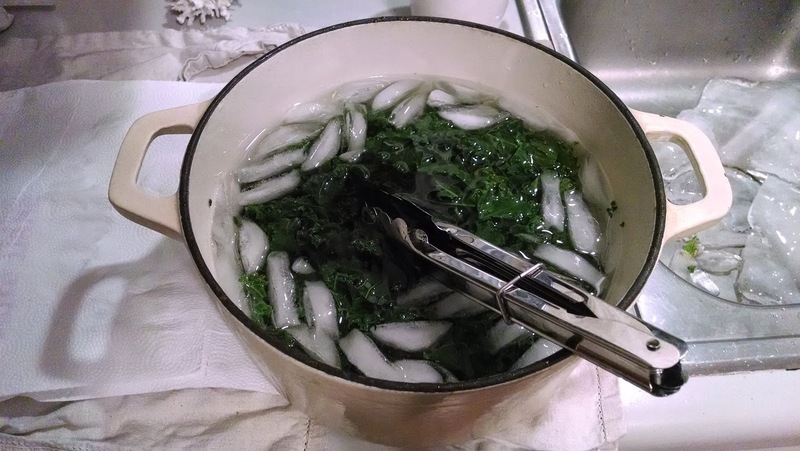 Step 10: Steam or boil kale stems for 6-8 min. Step 11: Place in ice water bath for 6-8 min. 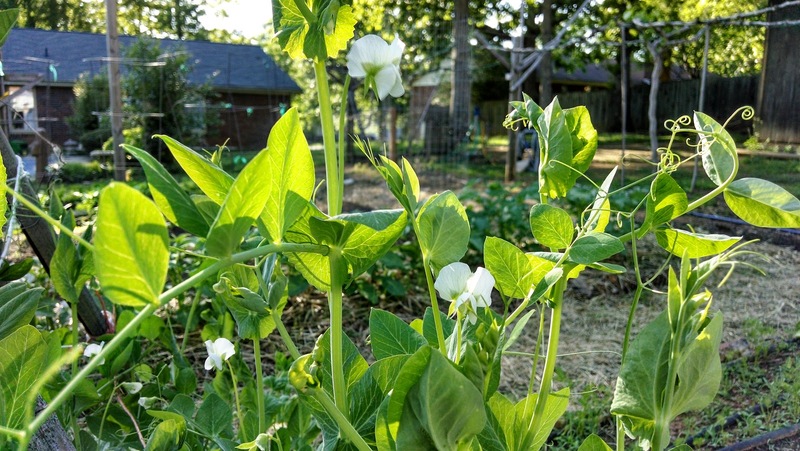 Bugs are a necessary evil in organic gardening. Removing bugs by hand is important and so is leaving some for the good ones to eat. 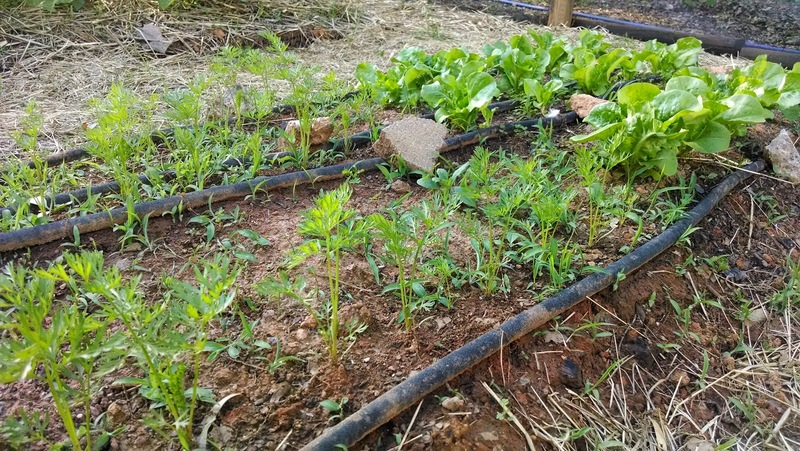 Last year, we bought our house which came with rows of grape vines and the occasional vegetable plant in between rows. 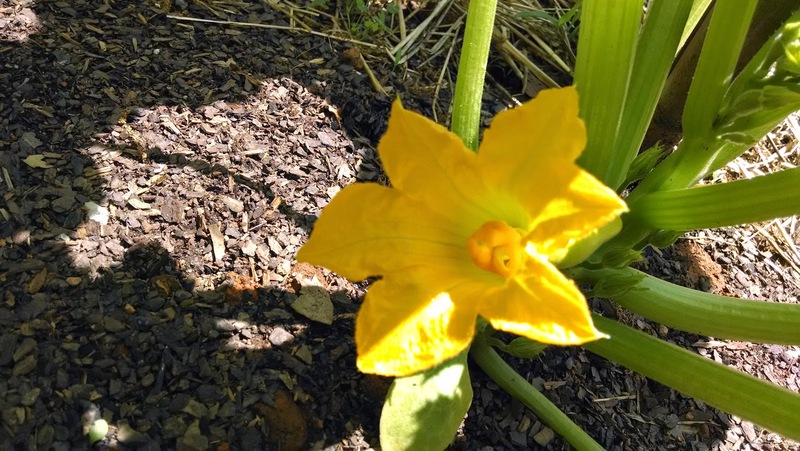 The squash I kept picking were big and beautiful, which was exciting until I started finding each squash plant had been eaten by bugs that burrowed inside and left jelly-like trails. 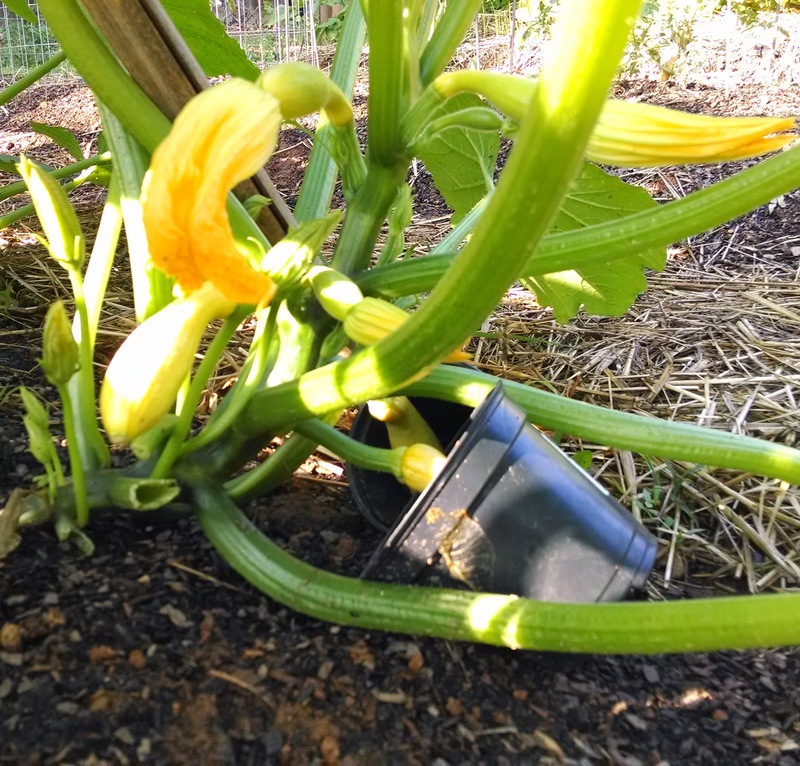 I am trying to prevent this from happening by utilizing plastic planters around the squash to keep a barrier in place between the delicious squash and the ground to reduce the risk of intruders. I'm hopeful, "but one never knows" as one of my employers use to say. 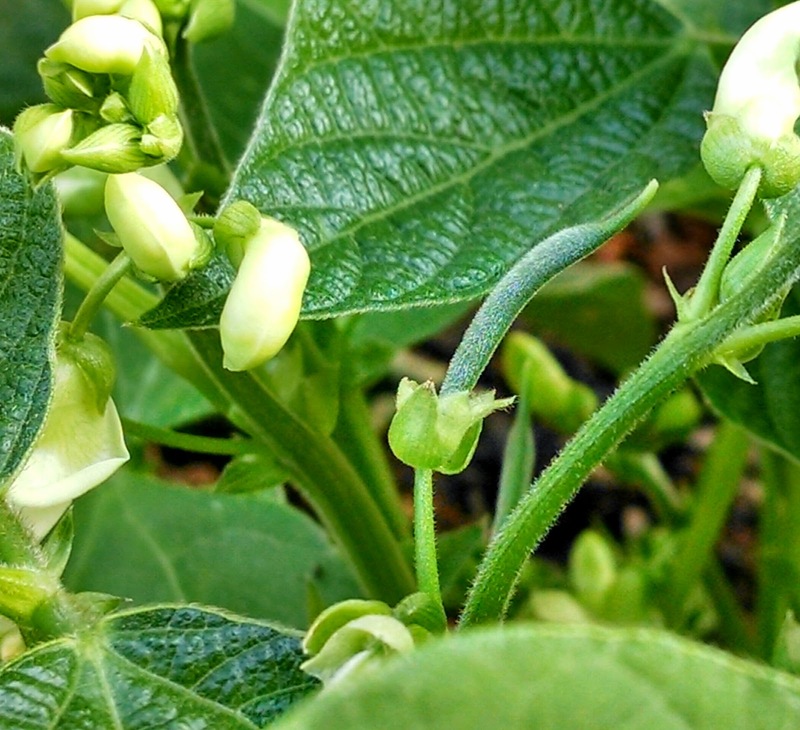 The bush beans having been blooming for roughly a week and just started showing baby green beans. 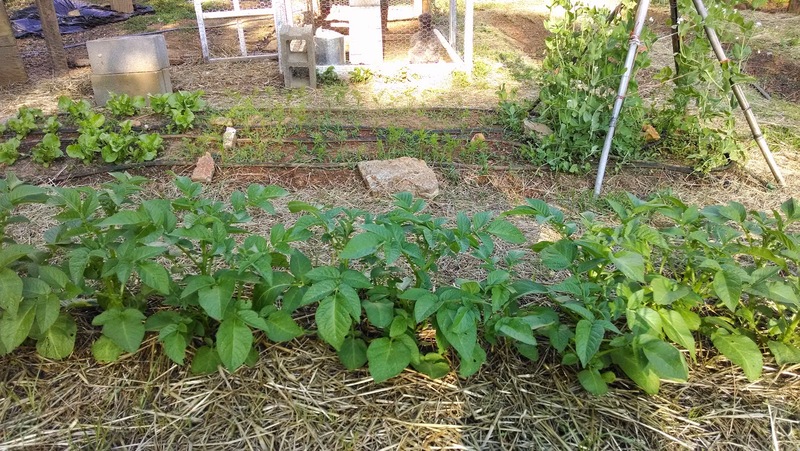 The curiosity and excitement of not knowing how many beans they will produce is killing me. There are roughly 20 bushes and I'm getting good vibes as all the plants are looking healthy. 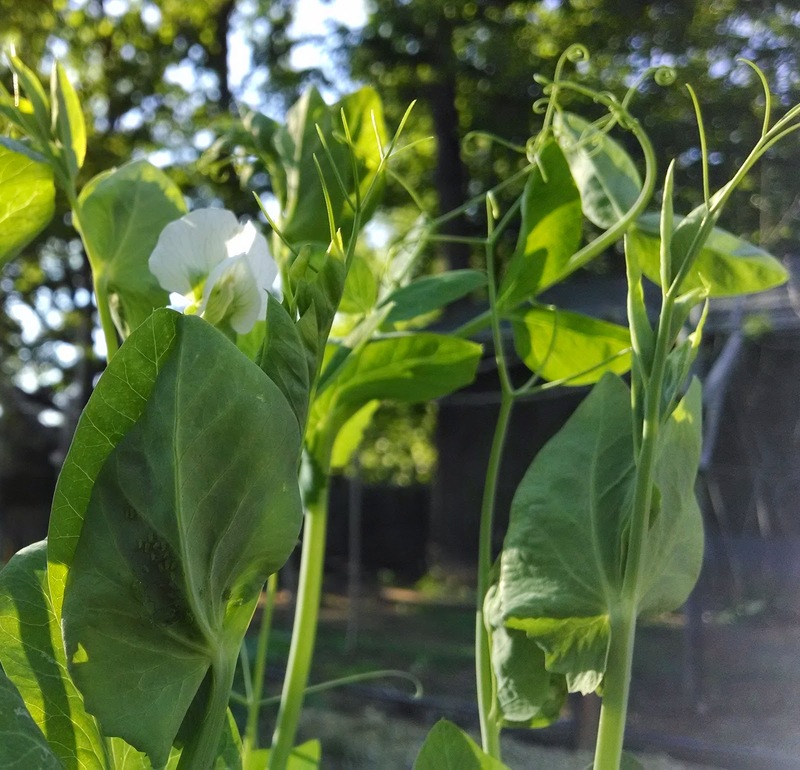 The early peas that I planted have been producing, but showing some discoloration in the leaves and have black spots on the pods, yet leave the peas on the inside beautiful and elegant. If you know what the discoloration is, please leave a comment. 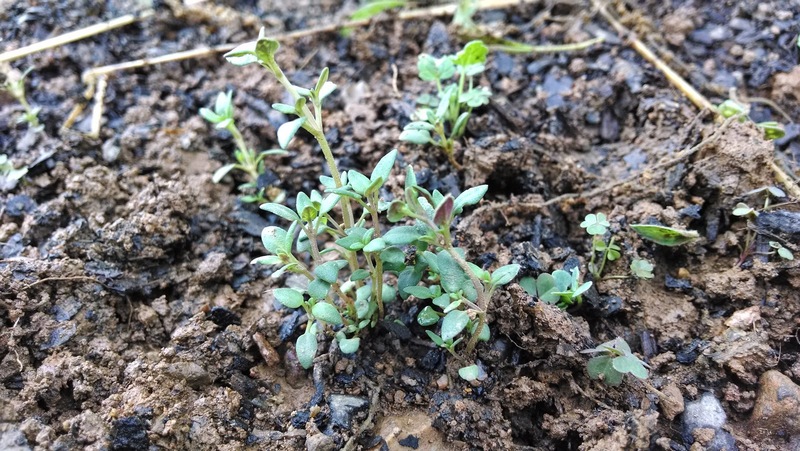 I add them fresh to my salads each day and they have a bitter sweetness to them. 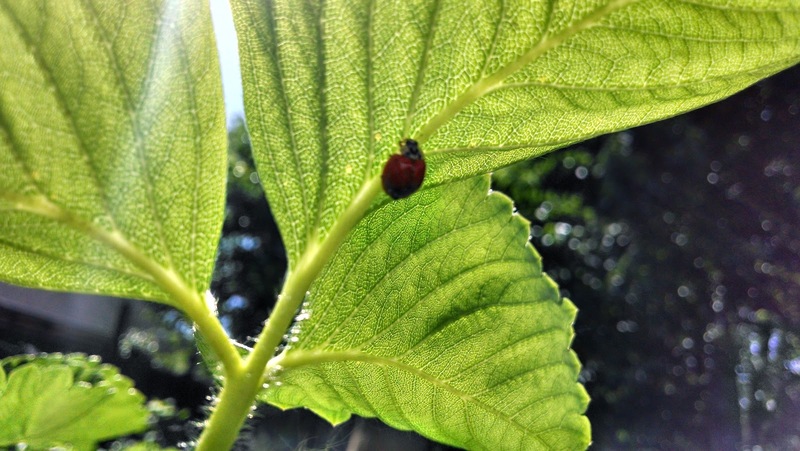 Ladybugs are great for your garden and eat aphids. Thank you! 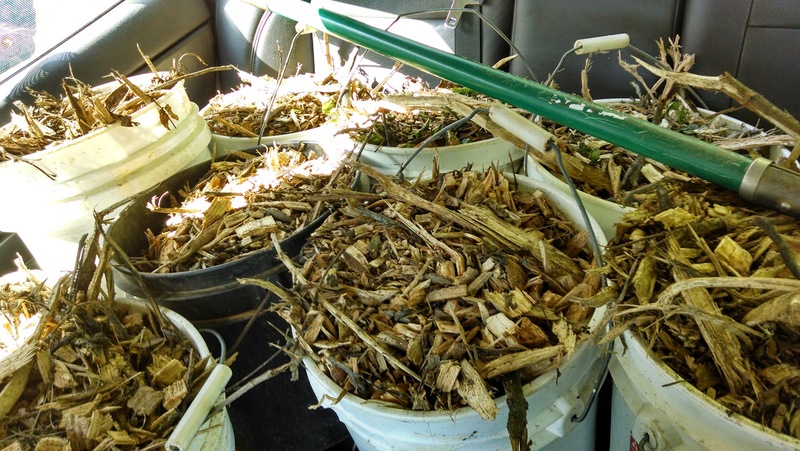 Any gardener reading this post has faced the challenge of keeping weeds out. 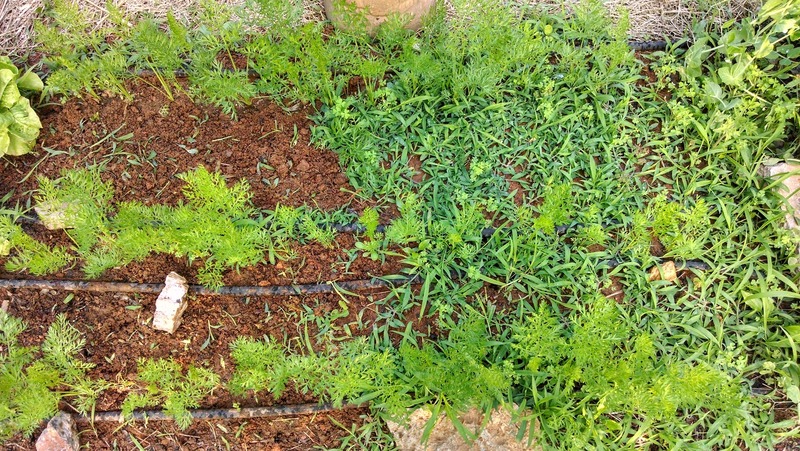 The reality of the job pictured to the left is this: "Honey, I need 30 more minutes to finish weeding the bed of carrots. Well, don't be too much longer, our son is having a fit and I'm about to make dinner. Ok, just 30 more minutes and I'll be in." 1 hour later, the carrots are finally done and your hands are covered in dirt. You look proudly down at your 2 square feet of success and if you're as nerdy as me, you snap a photo by wrapping your dirty hands with your less dirty t-shirt to hold the phone and tap the touch screen with your knuckle because it is the only clean part of your hand. The sunlight is disappearing and it is time to go inside, not to mention you have explaining to do because a husband's guess-timate is about as accurate as a psychic's medical opinions. This time, I got out of it without any consequences as I cleaned the house from head to toe while my wife was at work. Score! 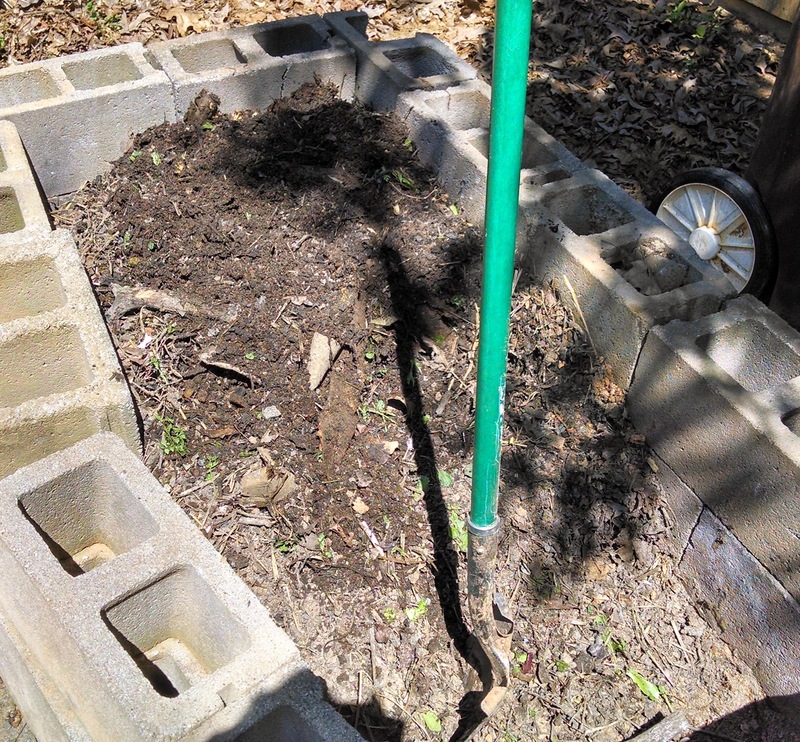 I hereby pledge to kill all the weeds that threaten my therapeutic sanctuary! 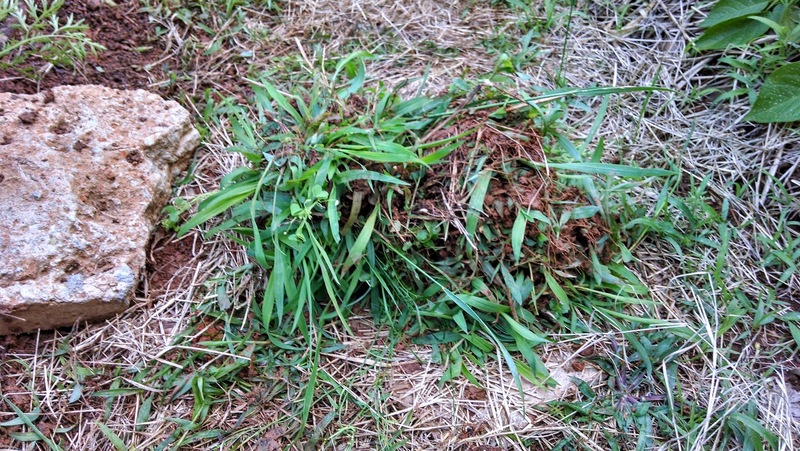 I used both boiling water and a homemade weed killer to take the weeds to task this weekend. 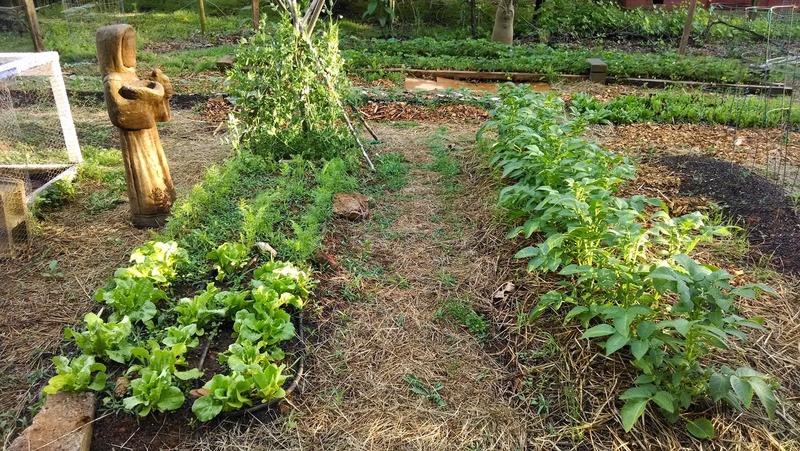 Let's take a moment to appreciate two methods of killing weeds at the perimeter of your garden. 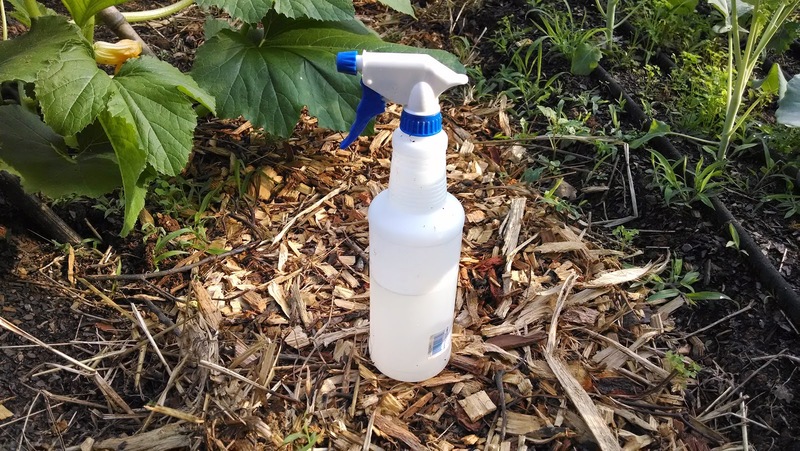 The homemade weed killer requires the following materials: 1 gallon of white vinegar, 1/2 cup of salt, liquid dish soap, and an empty spray bottle. Put salt in the empty spray bottle and fill it the rest of the way up with white vinegar. 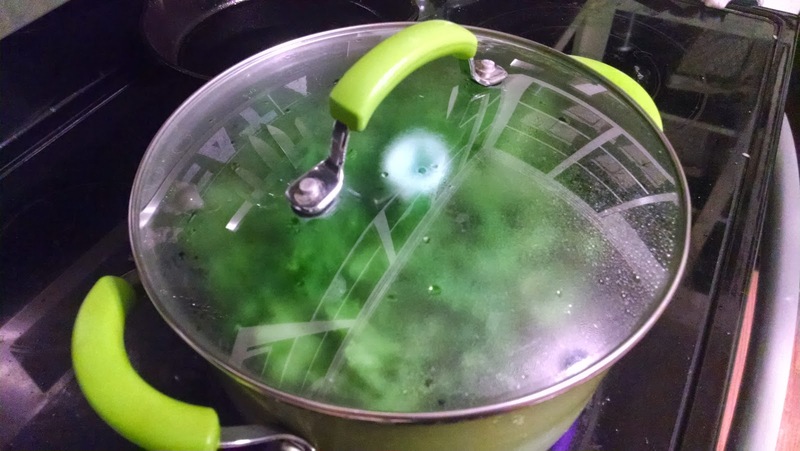 Add a squirt of liquid dish soap. This solutions works best if you use it on a hot day. Spray it on the weeds in the morning, and as it heats up it will do its work. 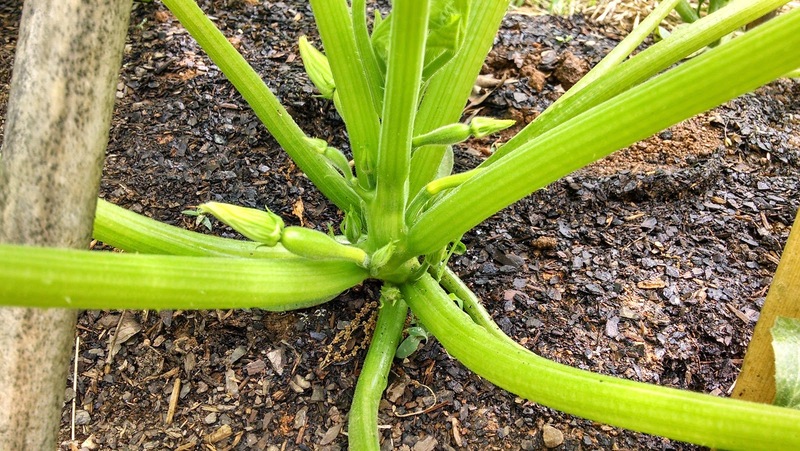 The boiling water seemed instant, but time consuming as you have to walk back and forth between the kitchen and the garden. 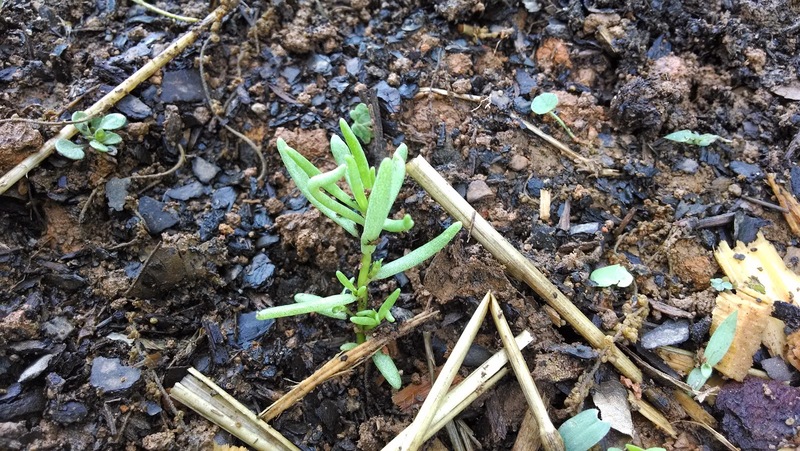 Boiling water may be the best solution for a few tough weeds. You also run the risk of burning yourself, where as vinegar can be washed off if it irritates your skin. 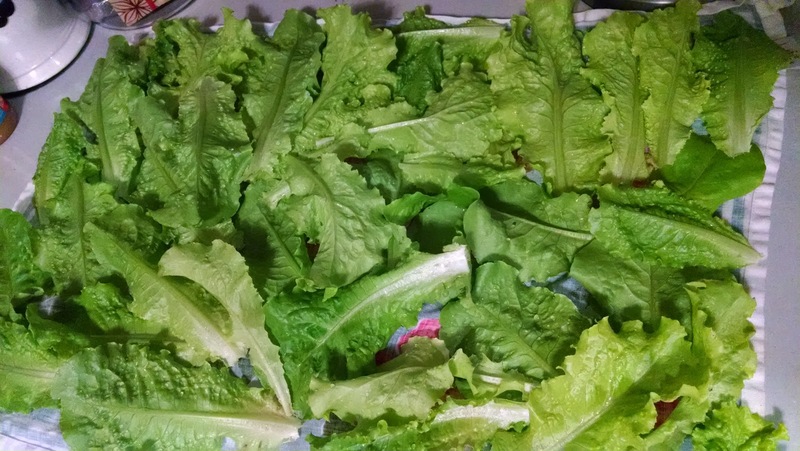 I have way more lettuce than I need so I am starting to cut heads of lettuce rather than pulling off individual lettuce leaves. 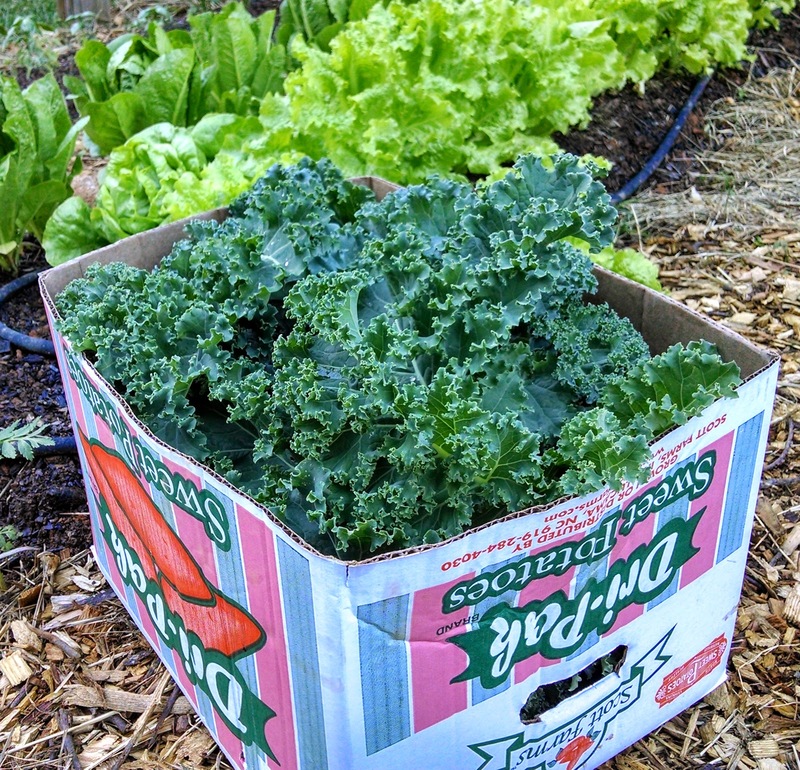 I have to say that it is saving me a lot of money on produce. My coworkers must think that I am some kind of salad snob by now because I bring in beautiful salads on a daily basis by using multiple varieties of lettuce in the same bowl. 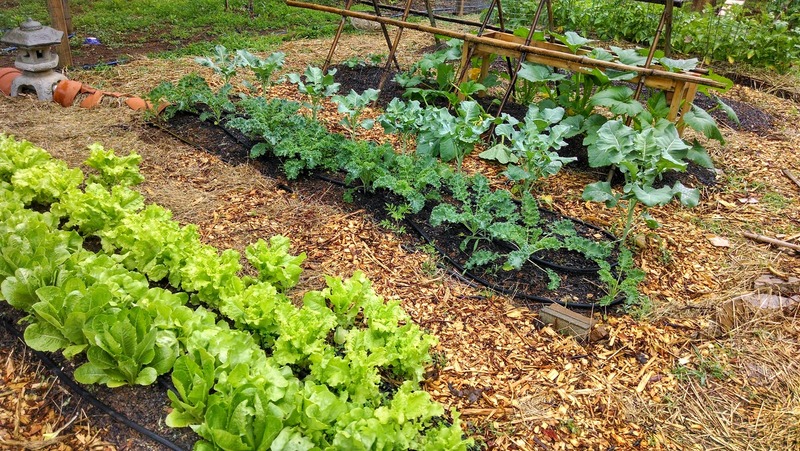 Don't ask what I was thinking, but next year I will be planting less lettuce and I intend on planting them weeks apart. 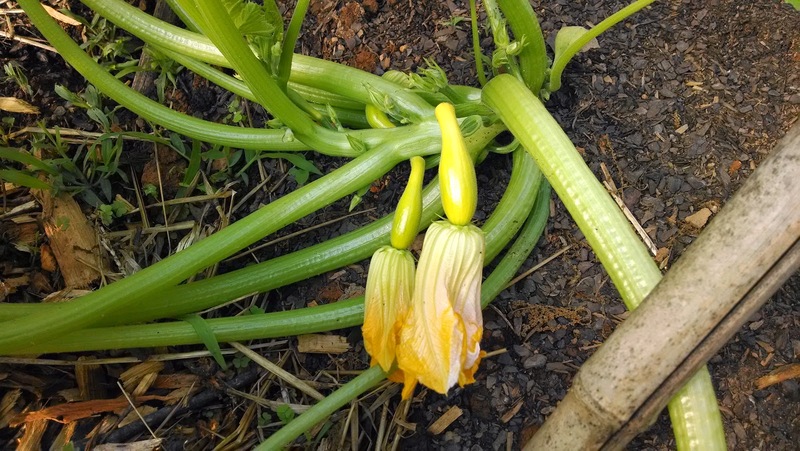 It is also important to consider that each variety takes longer than the other to become ready to harvest. 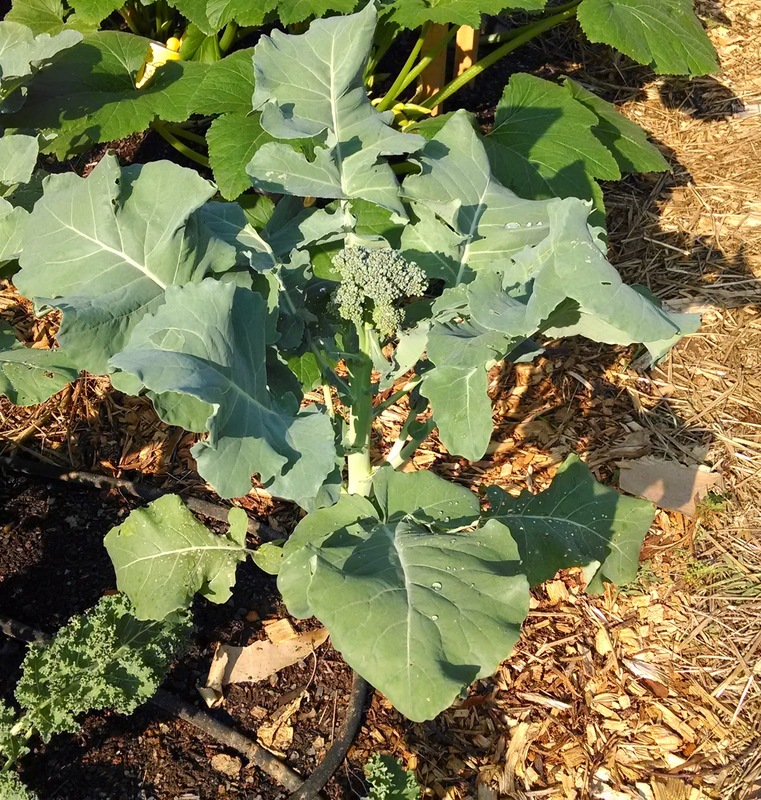 I didn't know what to expect when I grew broccoli. 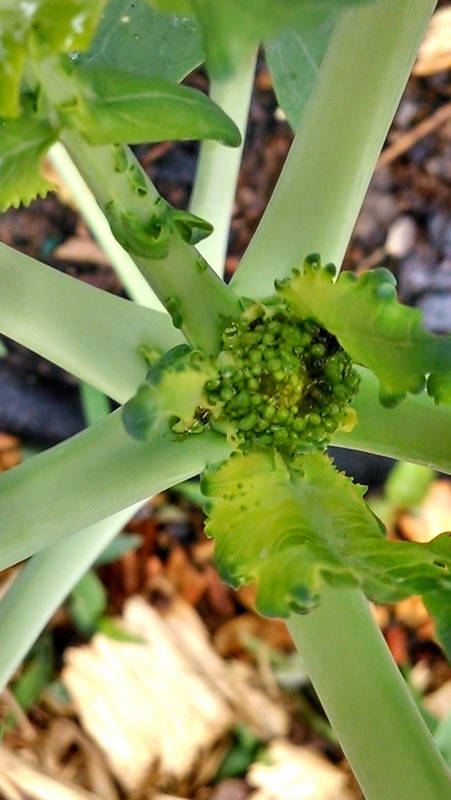 It was my wild card plant, as I had no idea whether it would work out. 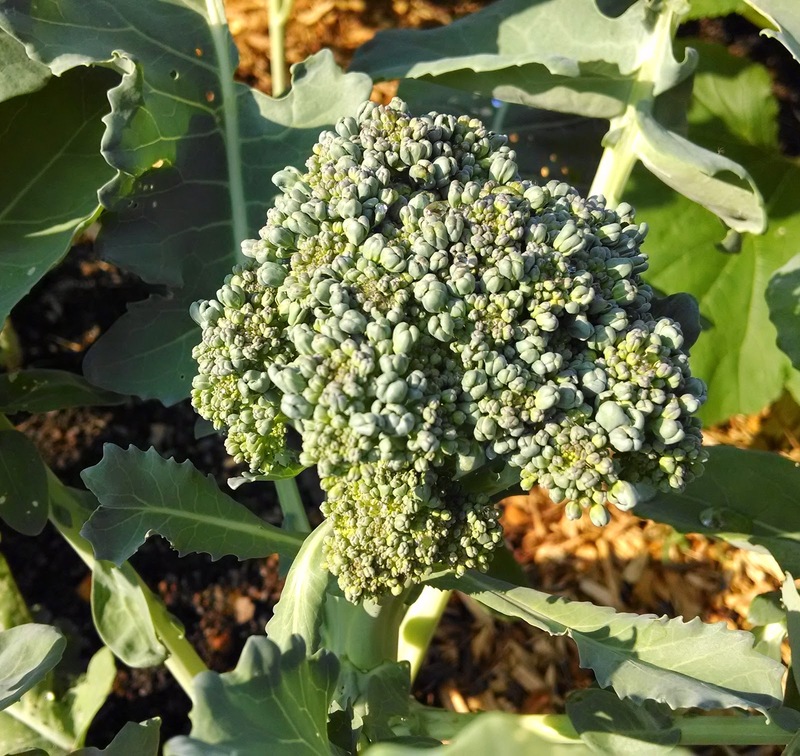 I have been pleasantly surprised at how large the broccoli plants have grown and that they are now producing broccoli heads. 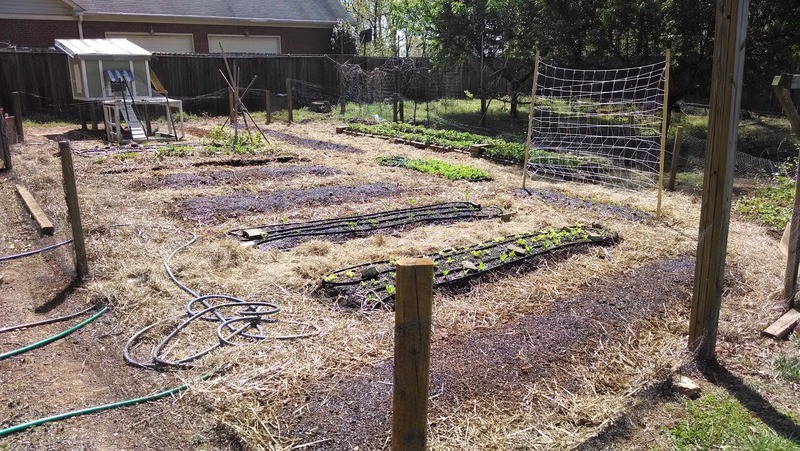 The herb garden was 95% grass and weeds. 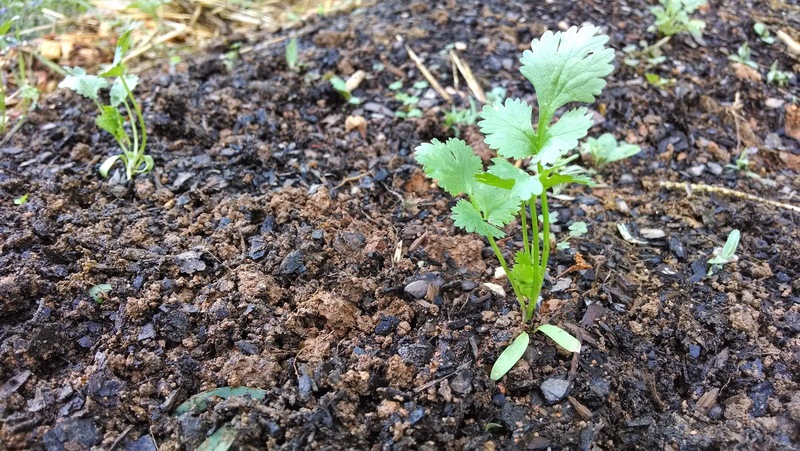 So, weedless to say the bed is now 95% herbs! 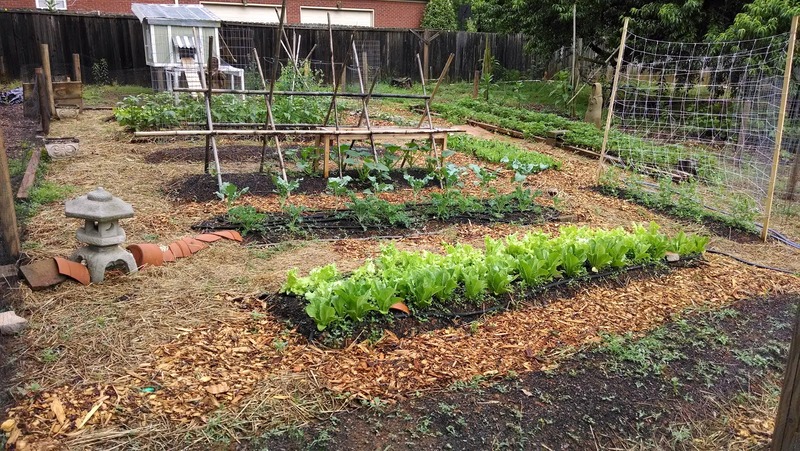 My new policy on weeding: 1 to 2 beds per week, no more and no less or I will get overwhelmed. 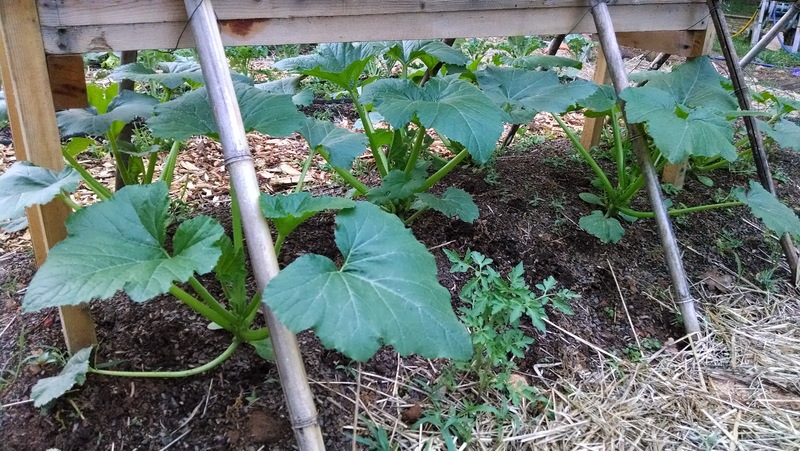 Truth be told, I am already in over my head, but I love working in the garden. 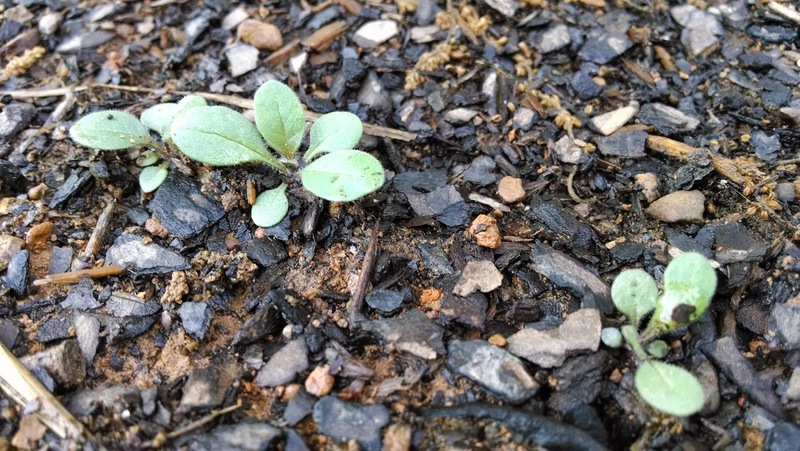 If I didn't love it and have a little luck, my drive wouldn't have survived the late freezes with having to run out to the shed at 9pm after work to cover up the rows of seedlings night after night. I can't express how happy I am that we have gotten through the last freeze. 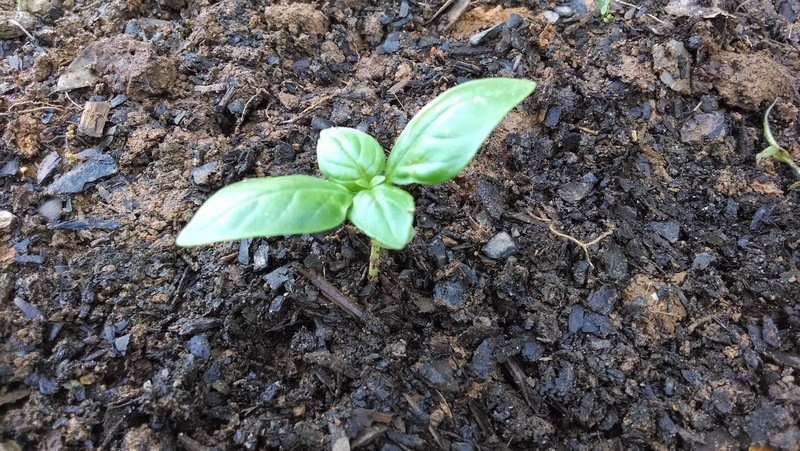 Take a closer look at some of the herbs that are popping up. 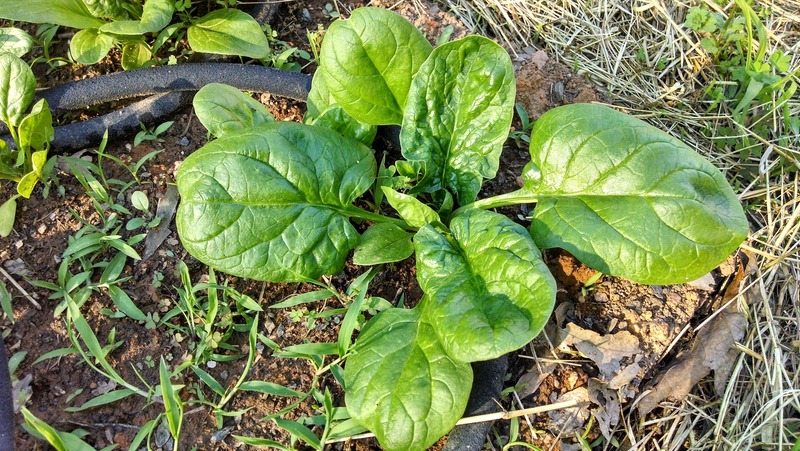 The spinach is ready to be picked, but I plan on leaving some of the smaller leaves so they can get bigger. 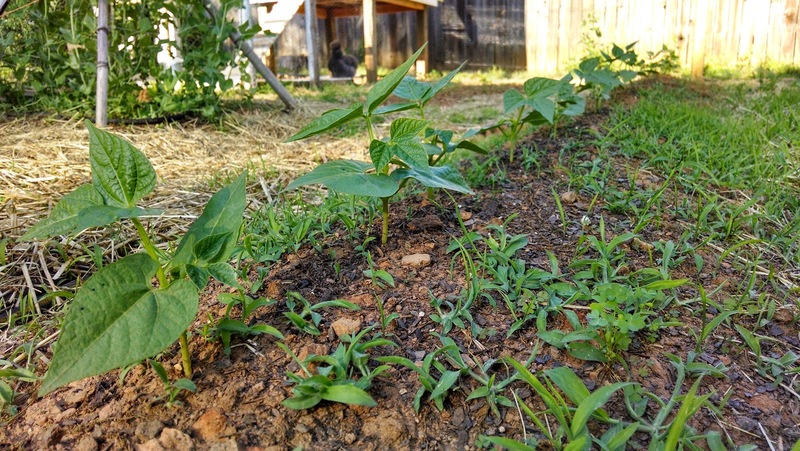 I plan on growing some edamame as soon as the spinach and mesclun mix has done its job. 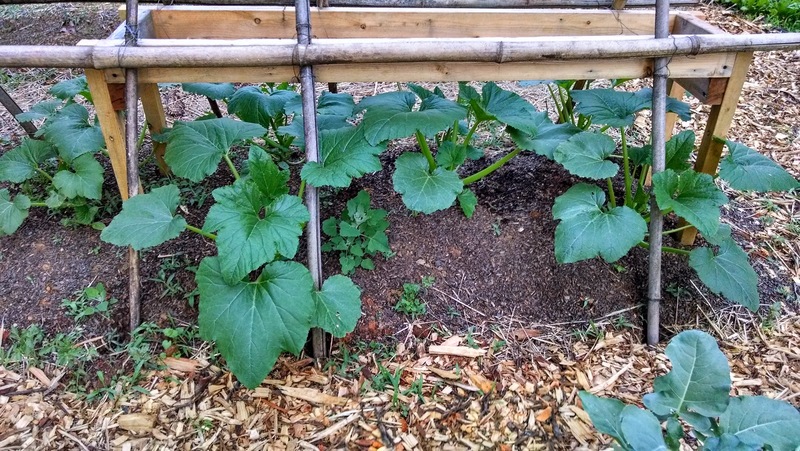 The squash plants look beautiful and seemed to grow a foot high in roughly one week. I saw people on Pinterest growing them upwards, so I added some bamboo and a wooden frame to support the plant. 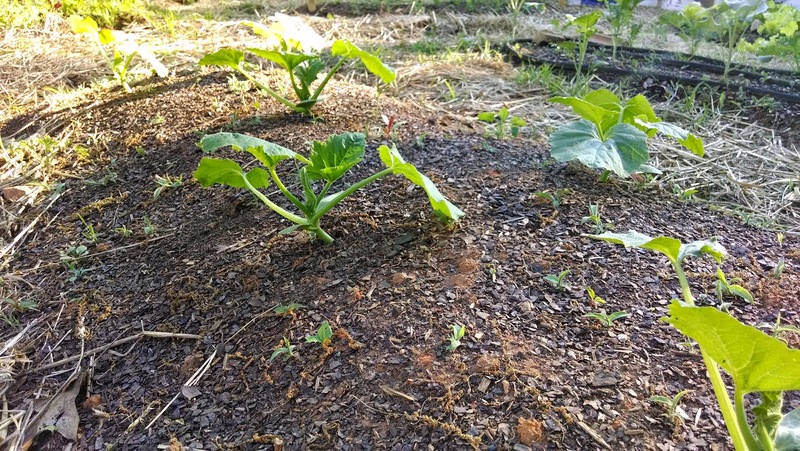 We'll see how this goes, as I am beginning to think the variety of squash that I have planted will not work well with the vertical growing idea. 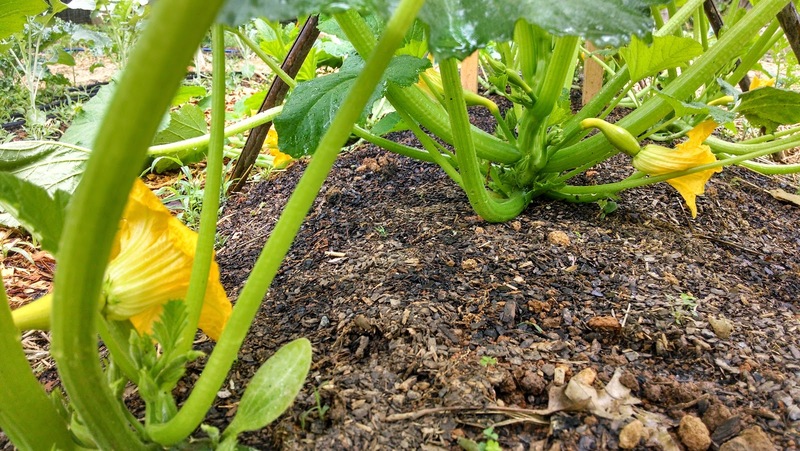 The cucumber plants were planted at the same time, but nowhere near the size of the squash plants. Don't forget to include some marigolds in your garden to aid in pest control plus they add a pop of color! 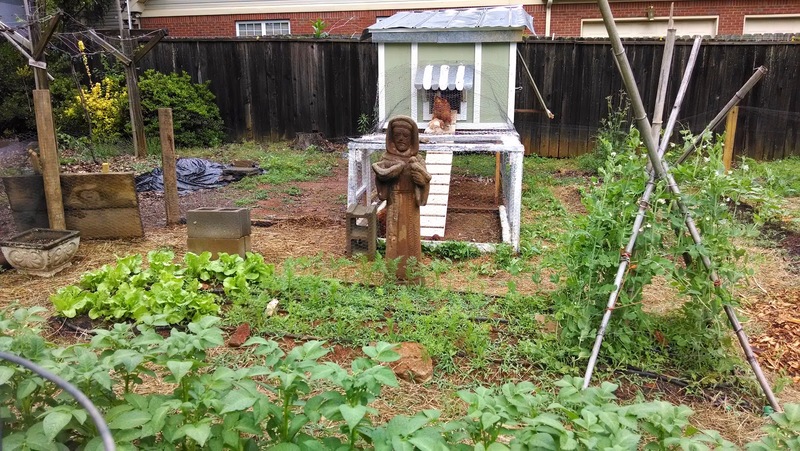 I moved a large St. Francis of Assisi statue into the garden and it fit the space perfectly. It is my understanding that he is a fan of the animal kingdom which is why he is chillin' near the chickens. 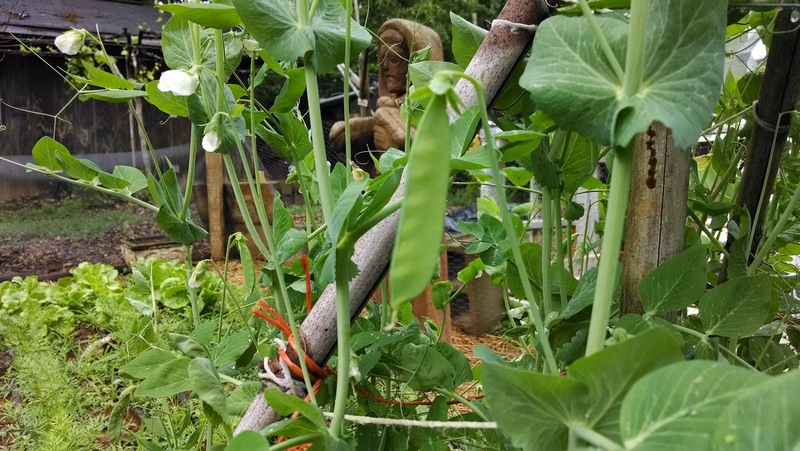 Peas are continuing to take form and I can't wait to starting picking them off the vine and shelling them. 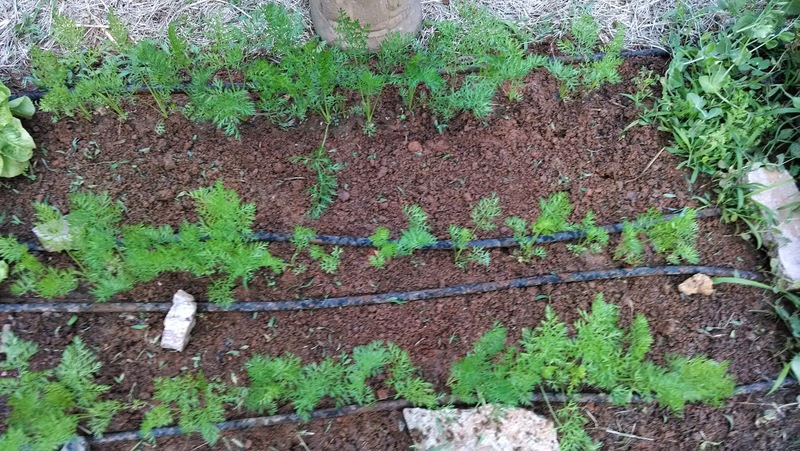 I started another variety of carrot in a new bed that I haven't shown, some brussels sprouts, arugula, and a sweet pepper plant. Tomato Tomata! 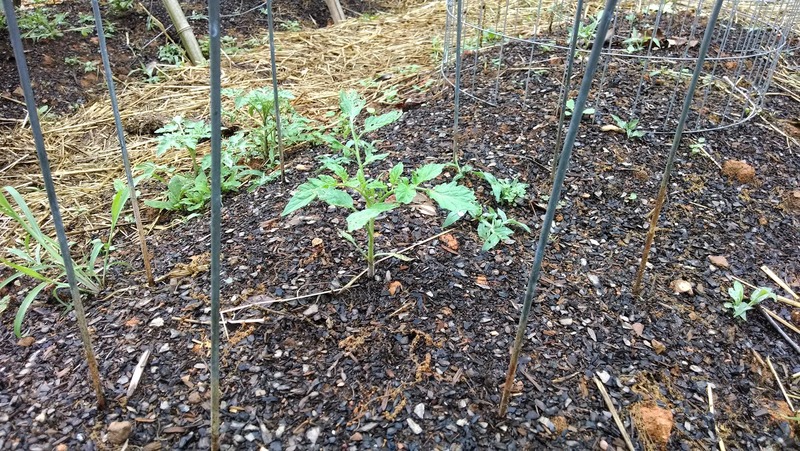 The tomato plants I direct sowed into the ground are starting to mature. 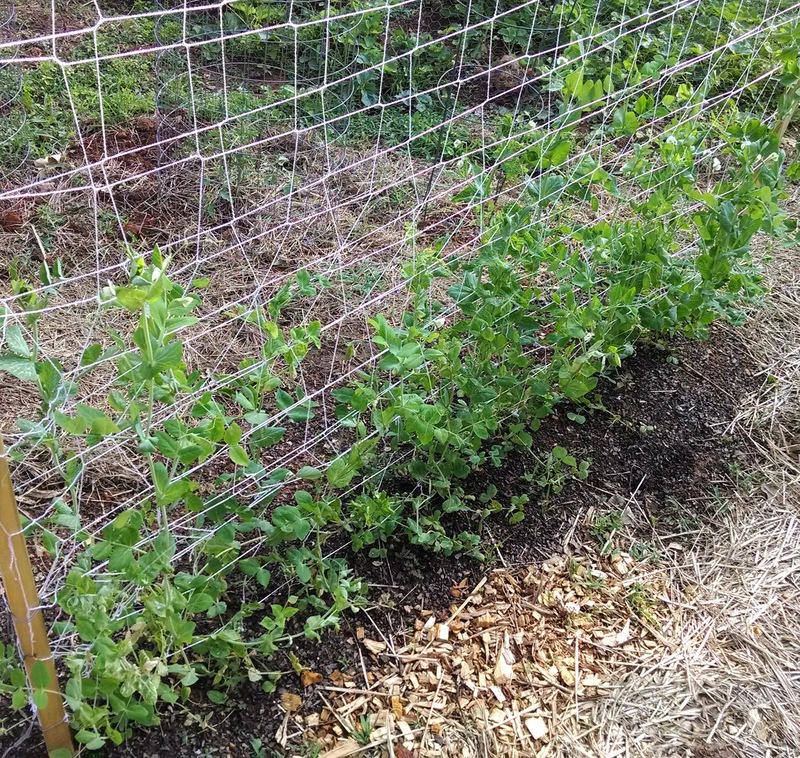 I will try to remember to remove the suckers that grow in between the main stem and its extensions that bear tomatoes. 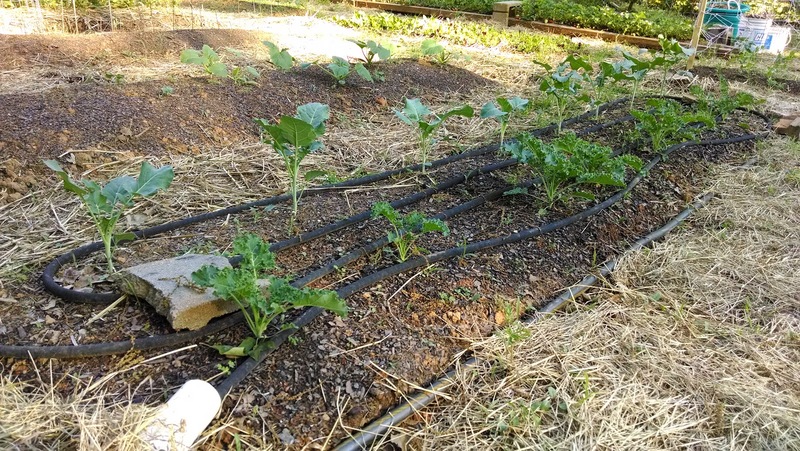 Using google and the words "growing tomatoes," you can find a wealth of information on how to grow them in a healthy and productive environment. 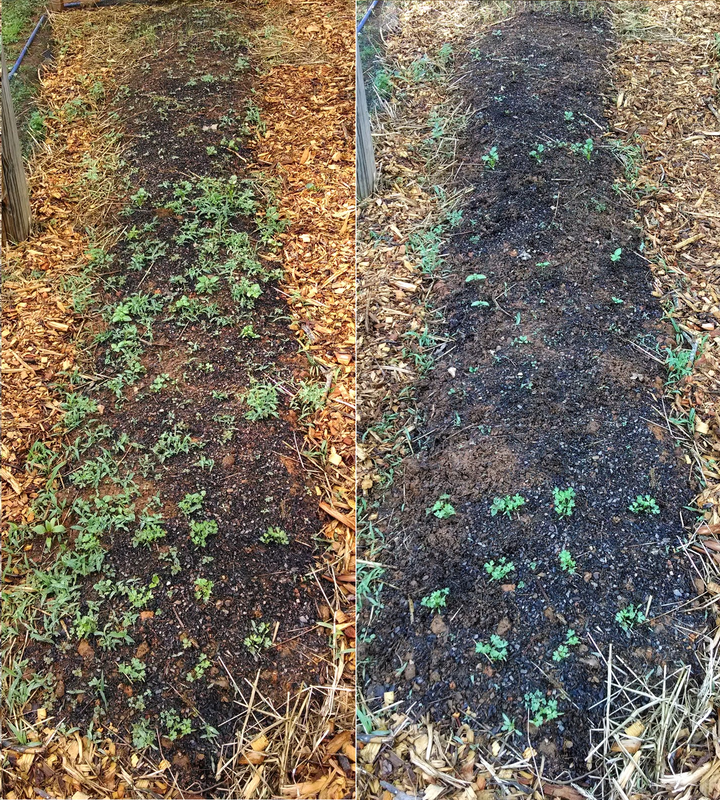 Check out some before and after photos to see how far the vegetable garden has come since it began 9 weeks ago in early March. Rain and weeds have kept me busy for the better part of the past two weeks. 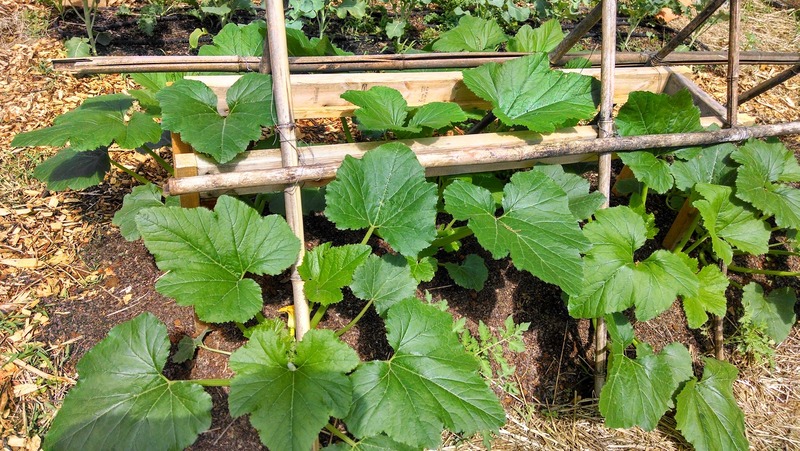 The rain has passed, but the weeds are still taunting me at each corner of the vegetable garden. 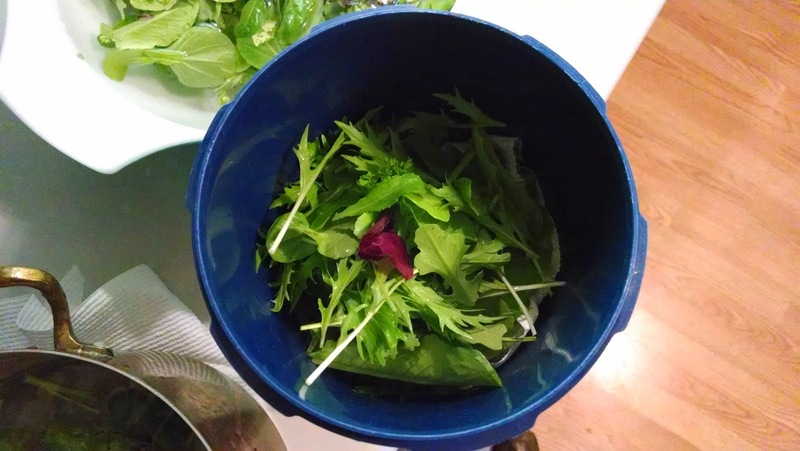 I figured it would be helpful to see a run down of what it looks like before the mesclun mix lands into my bowl. 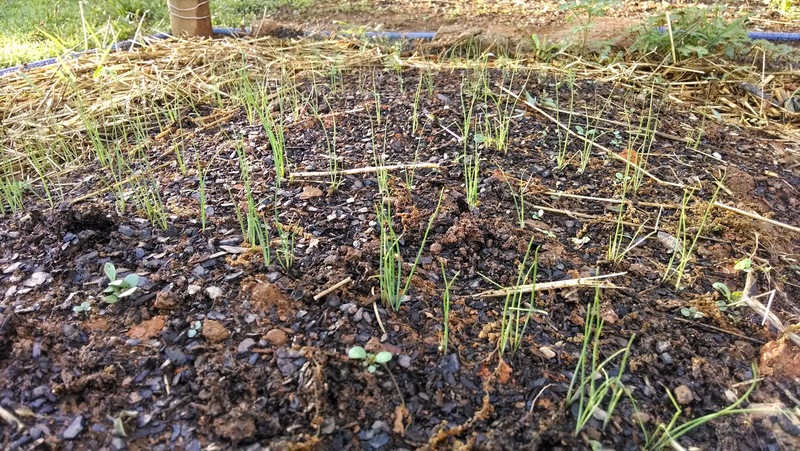 Note: I trim the mesclun mix down to a height of 2 inches and it keeps coming back like a bad haunting. 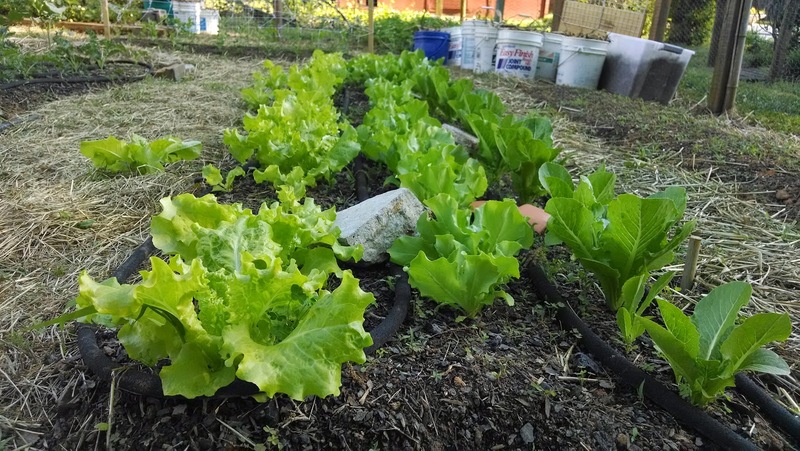 Most of the time, I am able to wash the lettuce greens right after I cut them, but it is best to cut in the coolest times of the day. If you cut it in the middle of the day, it goes limp and looks pitiful. 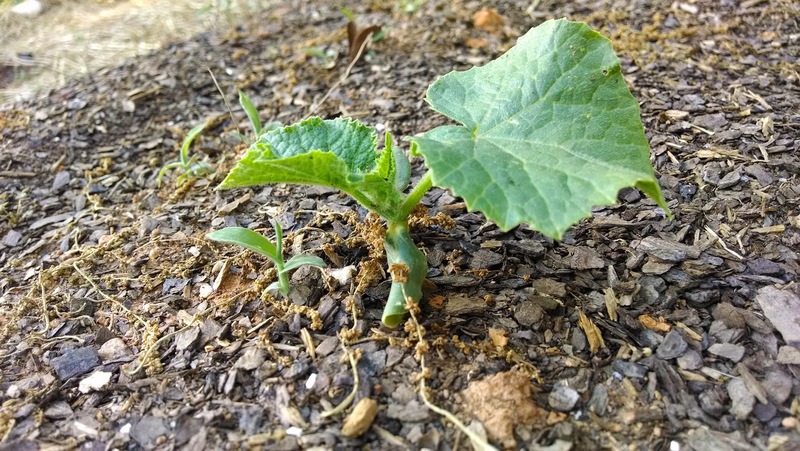 I learned quickly after getting a late start in the garden last weekend. My lovely wife suggested putting the lettuce trimmings in cold water and to leave it in the refrigerator. "Botta bing botta boom" it works! 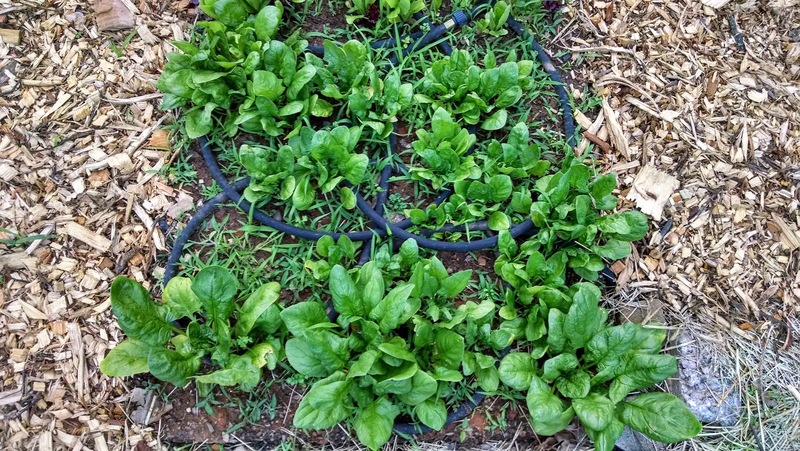 However, some lettuce had some discoloration and began to wither away, but most made a comeback. 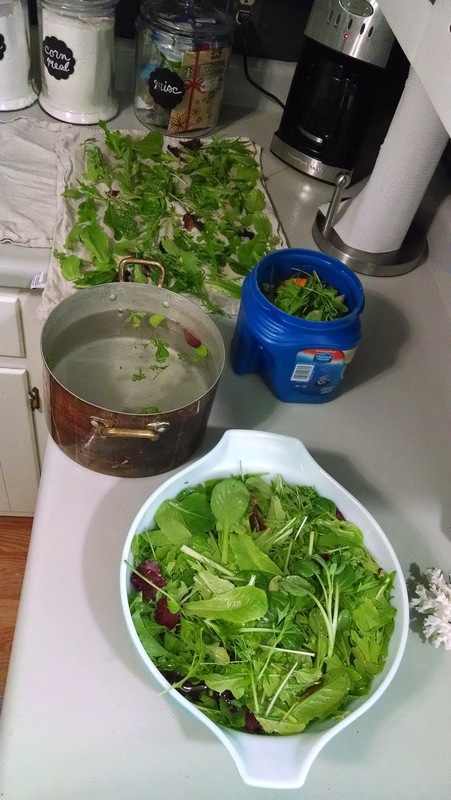 I put all of the greens in a bowl with water and took a handful at a time and added it to the pot with water to wash off dirt, critters, and anything else. 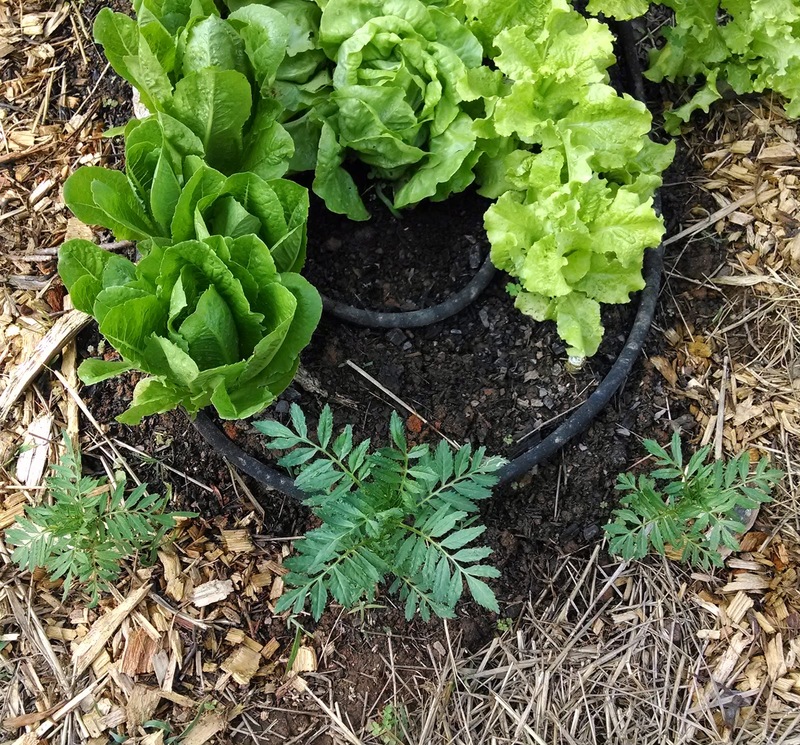 I kept one of my buckets (Foldger's plastic coffee cans work great) handy so that I could re-purpose the not so good bits of lettuce in my compost bin. 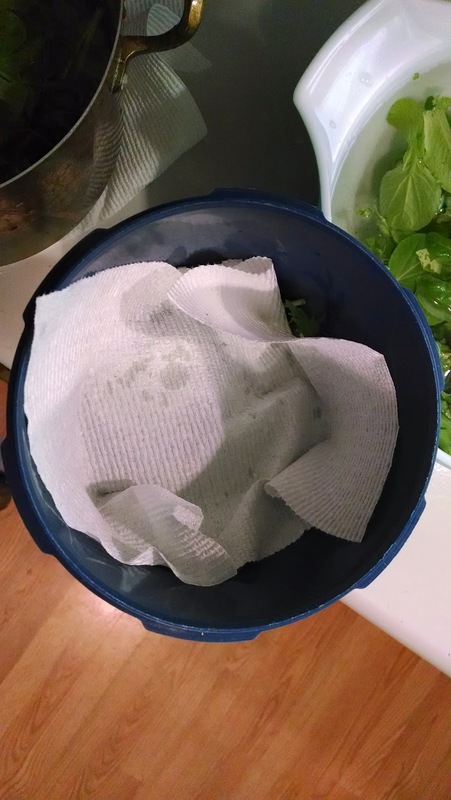 I put the lettuce in a hard plastic container and separated two servings of salad with a paper towel to help soak up extra moisture after letting the lettuce dry on towels for a few minutes. 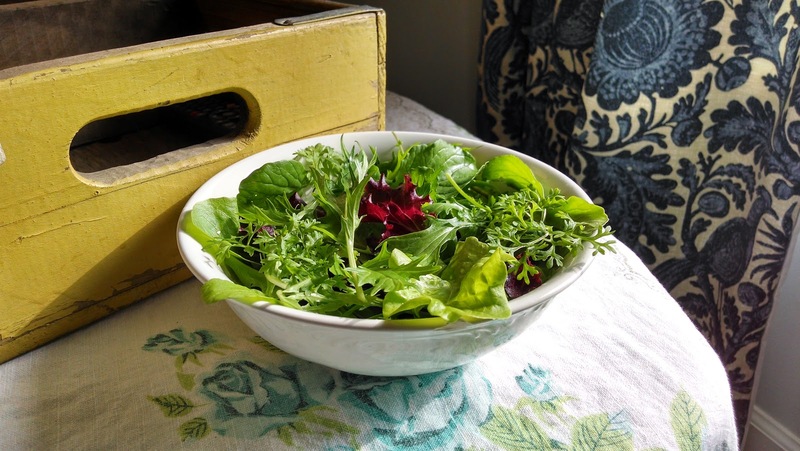 I have read that you can keep lettuce fresh and crisp in the refrigerator between 3 to 10 days depending on the variety of lettuce. 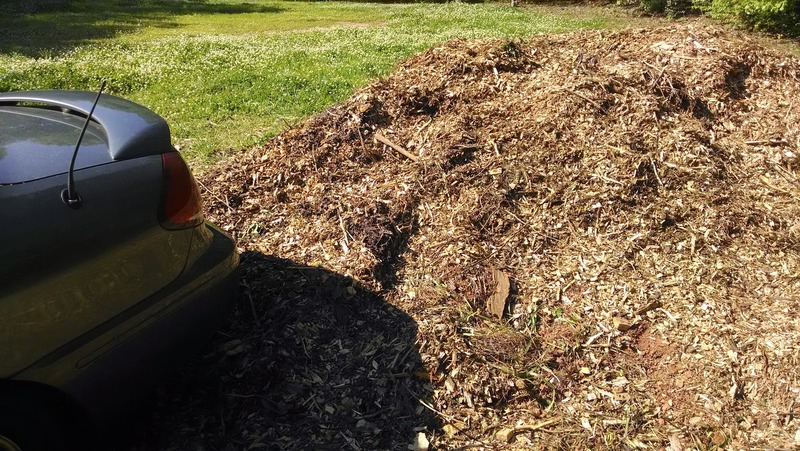 My compost is slowly building up to a nice pile of black gold. 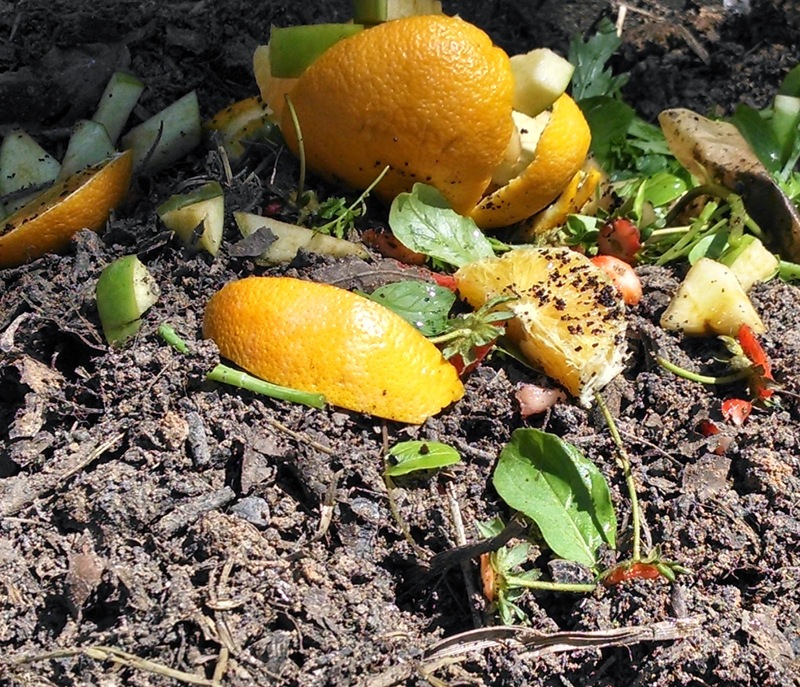 I use trimmings from plants, coffee grounds, egg shells, paper, cardboard, fruit scraps, and and earthworms to keep it productive. 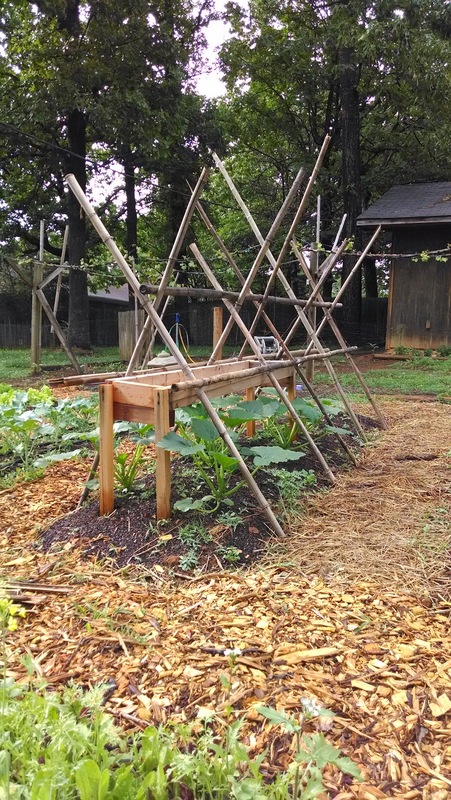 I can't wait to use this for next year's veggies or the fall plants. 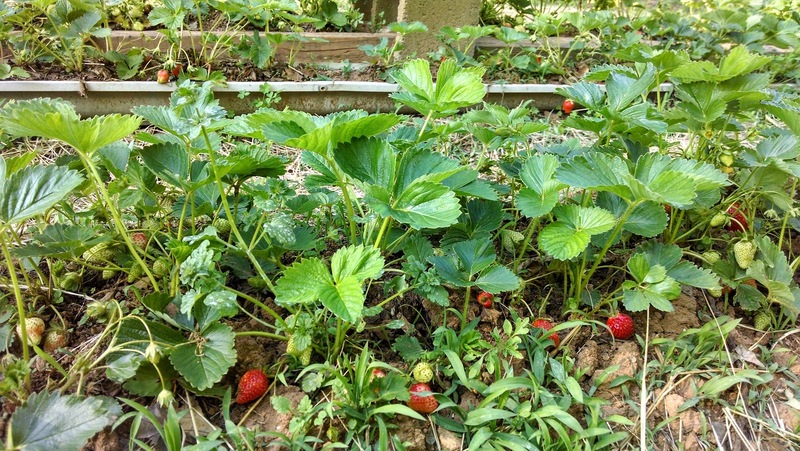 The strawberries are in full swing and really kicked into high gear the past two days. 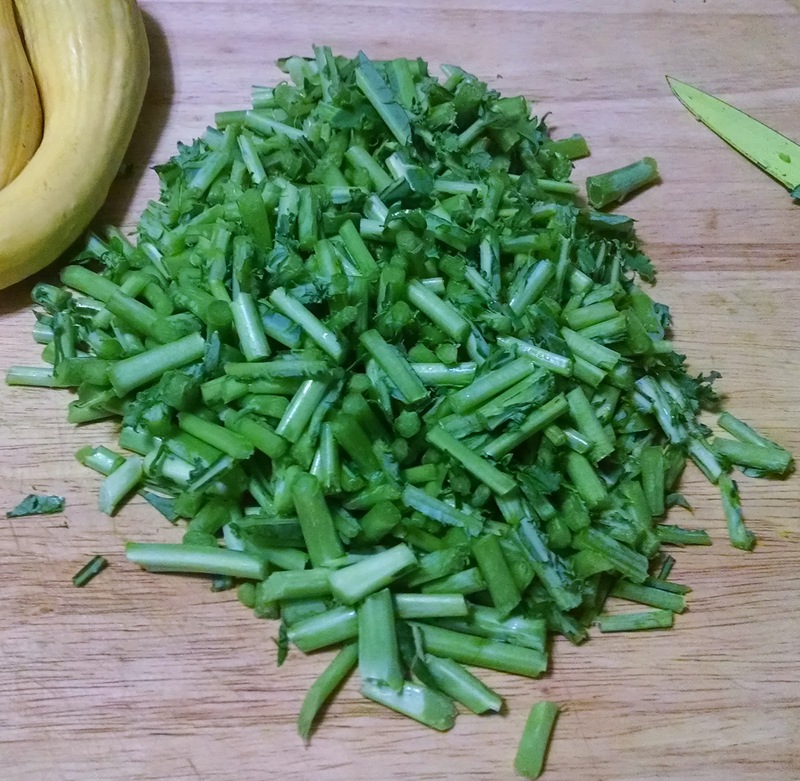 I have been cutting and freezing them as they have been ripening. 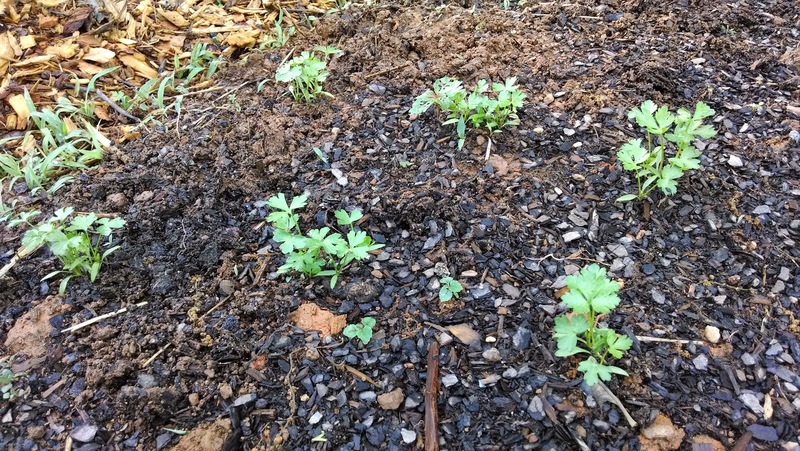 If you can't find the chickens or my son, look no further than the patch of strawberry plants on the outskirts of the vegetable garden. 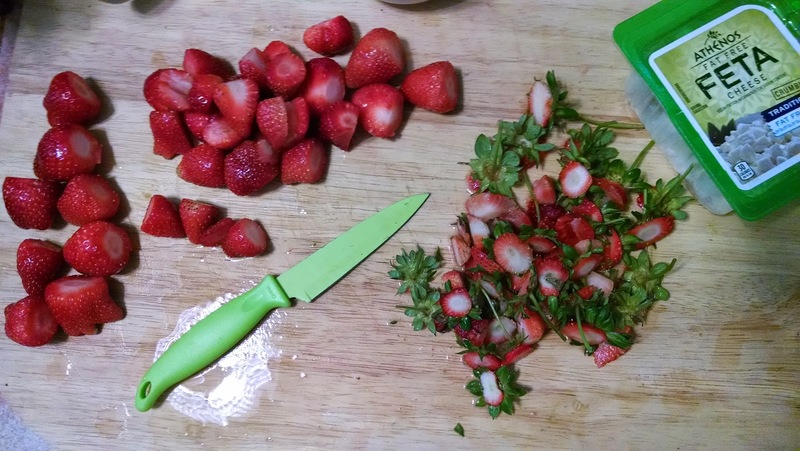 It is like watching the Hunger Games for strawberries. 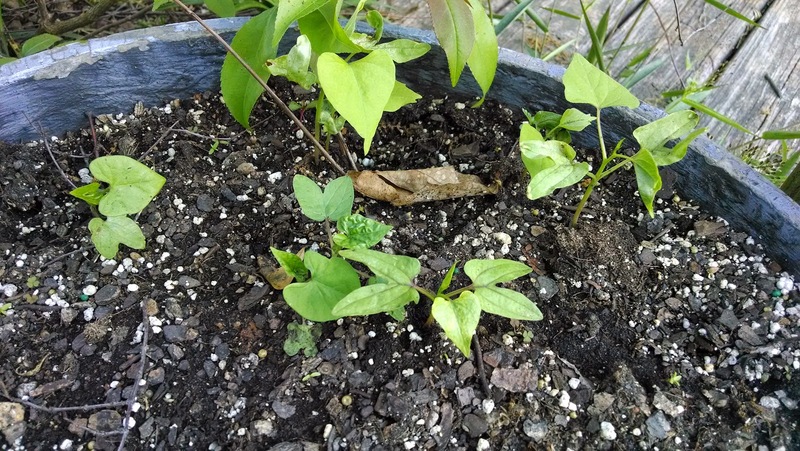 I planted some morning glories that my mother got for my birthday and they are beginning to show themselves. 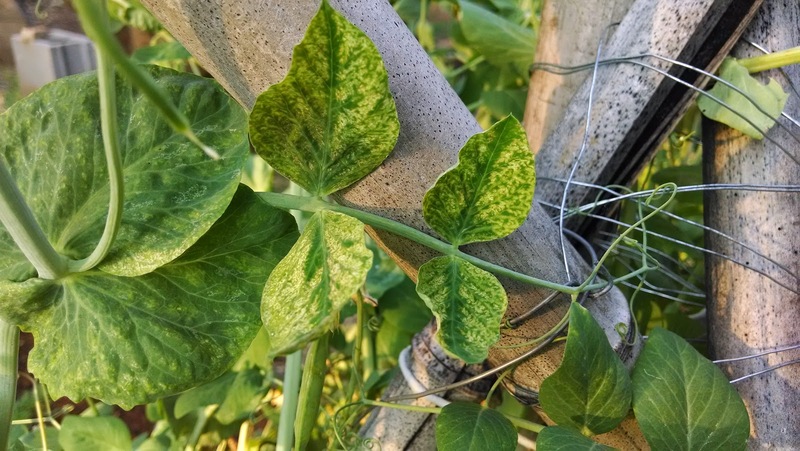 There are two pots on both sides of a wooden arbor and my hope is that they will grow up alongside an already established vine to add some color and beauty in the backyard. The ladies free ranging. I have a special place in my heart for the these lumps of feathers. I love free things, especially when they serve a good purpose. 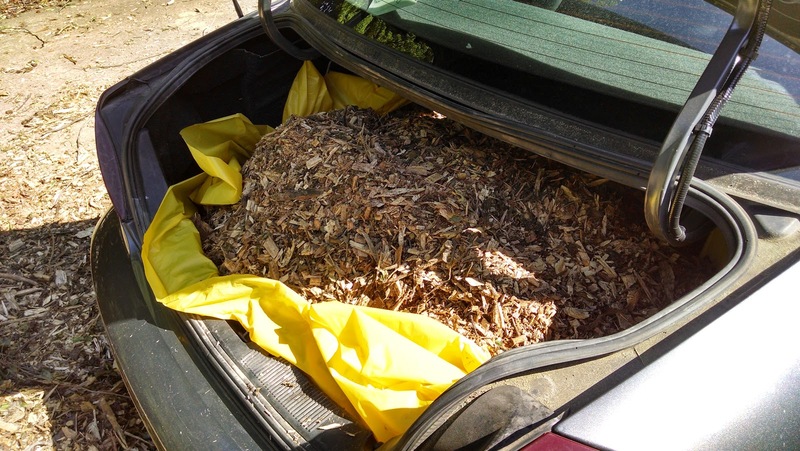 To help with weed control, I found someone giving away pine mulch. 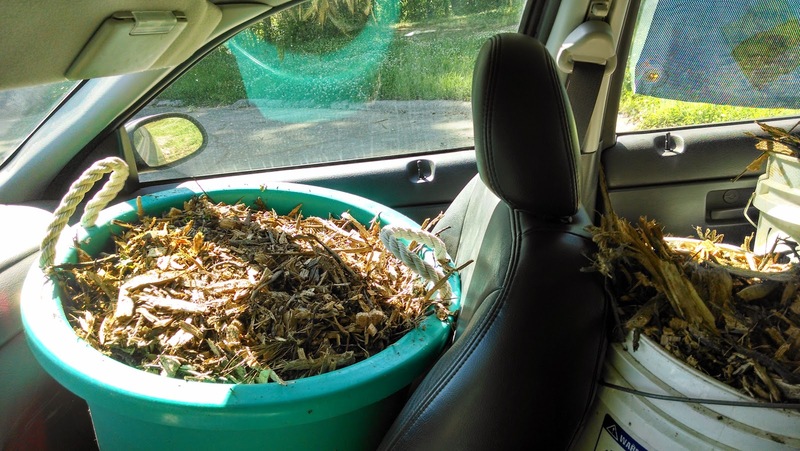 So, I loaded up my car with buckets and plastic sheets to haul as much of it home as possible. This is what it looks like when you make do with what you have and use your car like a truck. I heard once that people are most creative when they have less options.